Winter is Here! Be Photographed for Refinery29! Snow has finally arrived here in the Windy City. I actually enjoy shooting winter street-style because I think the piles of snow on the ground add a lovely sense of texture to my photographs. 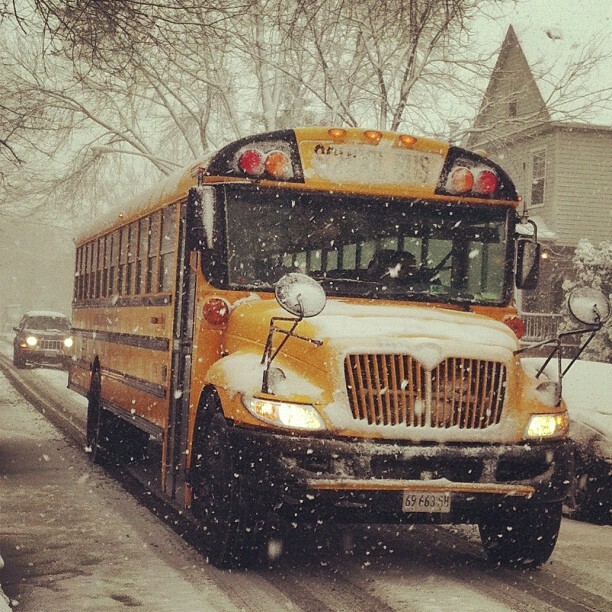 I took this photo of a school bus navigating the treacherous roads on Thursday while running errands after the Refinery29 open call street-style photo session. Although I’m no longer re-posting those photos, I’m still shooting for Refinery29’s street fashion section. With the sleek new redesign of my blog I want every post to be special and fresh; never redundant. You should already be checking Refinery29 Chicago daily to stay informed about upcoming parties, the hottest sales, and the latest trends, but I just gave you another reason; exclusive street-style photos! If you missed meeting Refinery29 Chicago editor Shani and I last Thursday we are hosting our final open call street-style shoot this Sunday in Wicker Park. The photos will be used in a special editorial photo slideshow about Chicago’s winter street fashion. With only two seasons here in the Second City – construction and winter – Chicago women know better than anyone else how to maintain fierce style during the coldest months of the year. Dress up in your street-style finest, but keep it real. We want to photograph you in your best every day winter look. Don’t go wild! The purpose of this is also to give our readers who have amazing style a chance to be featured on Refinery29 without needing the sheer luck of being spotted randomly by one of us street-style photographers. Those of you who know me well know how strictly I adhere to the protocol of only taking street-style photographs of people I randomly spot on the sidewalks. Like many of you, I believe in the strictest definition of street-style; that the person has to be randomly spotted, and dressed for themselves (not for a photographer). Since my blog evolved into being about more than just street-style I like to do other features as well, like outfit posts featuring my friends and other Chicago fashion bloggers. Like many of you, I don’t really consider that true street-style because it’s not random if it’s scheduled. That’s why I always disclose in the post itself when I’ve artificially produced a photo session for my own blog. Like many of you, I prefer the energy and spontaneity of the randomly spotted street-style images, which is why they make up over 95% of my posts on this blog. That being said, it’s just as important to highlight the style of others who aren’t as lucky to run into me on the streets. In that spirit, I thought this was a lovely idea to give anyone the rare chance to be photographed by me and featured in a street-style photo slideshow on Refinery29. But like the randomly spotted people who make up the vast majority of my pictures, your outfit will still have to be approved by the tough New Yorkers who run Refinery29 in order to make it into the slideshow. That’s why we want you to look your best! When: Sunday, January 15, 2011 between 12 pm and 2 pm. Who: Refinery29 Chicago editor Shani Silver and I will be there. Come hang out with us! Welcome to the new look of Chicago Street Style! The update also includes a formal new name, Amy Creyer’s Chicago Street Style. My blog became far more personal than I originally intended and I wanted the new title to reflect that. I’m happy it happened because it’s given me the opportunity to learn more about myself and to bond with my readers in the process. This new transition is a fresh start and it felt like the right time to formally announce the new title. You will also see a wider variety of posts in addition to my street-style photographs, which will of course remain at the core of my website. What you see today is the result of one person’s hard work, planning, and creativity. Maria Tzeka, an enormously talented web designer and interactive media developer, reached out to me a few months ago. She offered to help me revamp my blog, which she avidly reads. Maria felt that I deserved a sleek website to showcase my increasingly professional photographs. It was an offer that no person in their right mind would refuse! A month later I met Maria for the first time at Ralph Lauren Cafe to brainstorm concepts for the new blog. We kept in touch throughout the development process and came together for the final look last week at Hannah’s Bretzel. I was blown away by the results as she had perfectly translated our vision. She was a pleasure to work with, flexible, and hard-working. Furthermore, she has the very rare combination of being both a coding wizard and a creative design genius. I offer her the highest recommendation possible, and I cannot to work with her again in the future. Thank You 2011 For Making My Dreams Come True! 2011 is the year when my dreams came true. Before I started this blog in the summer of 2010, I felt kind of lost, like I hadn’t figured out where I was supposed to be heading in life. It wasn’t until this website gained some traction, in early 2011, that magical things started happening. First, I started working with PinkMemo and Refinery29 as a contributing writer and photographer in January. Then in February, Marcus Riley of NBC Chicago filmed a documentary about me taking street-style photographs outside of New York fashion week. Also in February, my Cynthia Rowley Spring Trunk show party saw over 100 guests come out to meet me, the Gaudy God, and Anthony Maslo (to whom I owe both a huge thank you, without you the event wouldn’t have been such a success). Then came the features in the mainstream media, including the Chicago Sun-Times and CNN. Later in the summer I also spoke at the University of Chicago on how brands work with bloggers during the 20SB Summit. In April, I signed a contract with Timberland to photograph their Man-On-Street social media campaign for the relaunch of classic workboot. It was my first big assignment, and was my first taste of the advertising world. Then came more corporate projects with companies like Oliver Peoples, J Brand Jeans, and Proctor & Gamble to name a few. And who could forget the collaboration Jena Gambaccini and I did with Microsoft Bing?! A collaboration between the Gap and Vogue magazine flew me out to Los Angeles to visit the Gap’s design headquarters for an exclusive preview of their Fall collection. It was a life-changing experience to see how companies take us bloggers seriously. The highlight of 2011 – hands down – was my trip to New York’s Spring 2012 fashion week in September. Not only did I get to meet my street-style icon, Anna Dello Russo at an exclusive blogger breakfast at Vogue’s Conde Nast headquarters, I also got to hang out with Bryan Boy (who is the sweetest guy ever) and my new friend Ann from Holier Than Now. And last, but certainly not least, my collaboration with True Religion and Milk Studios fulfilled a life-long dream to be backstage at New York fashion week. In exchange for taking five street-style photos a day for True Religion, I had backstage VIP passes to every show at Milk Studios. It was an enormous privilege to have all-access passes. I always said I’d know my blog was successful if I ever had the opportunity to go backstage at NYFW. And it happened, only one year after starting my blog. I am also thankful to the people at The Feast and NBC Chicago for featuring me again this fall in a video about how to get spotted by street-style photographers like me. I am infinitely blessed to have two parents whose support allowed me to follow my dreams over the past year. Both are dreamers themselves; my father retired in his mid-30s to become a cattle rancher (one of the reasons we moved to Arkansas); my mother is a life-long adventurer who climbed to the top of Mt. Aconcagua (the highest mountain in South America) in her 40s. At the same time, both have vigorously encouraged me to figure out a way to translate my blog’s popularity and success into a real career. The work that I’ve done with corporate clients showed me that what I really love is coming up with creative strategies and executing them for brands. I graduate from DePaul in June with a Master of Science in Management. I only have two classes left and if everything goes well I’ll land a position at an advertising agency before then!